Simple changes in the way you market can result in big changes in your profit. In fact, with a few tweaks you might easily increase your income by several hundred dollars each week, depending on your traffic and offers. 1. Cut your costs. Are you buying traffic? Look for ways to get the same quality of traffic (or better) for less price. Are you paying affiliates? Consider paying MORE on the front end and less on the backend – done correctly, this can often result in more effort from affiliates and more long term profit in your pocket. 2. Increase the profit you make on each sale. This could be as simple as raising your price, or offering an upsell, a downsell, a one time offer or a combination. 3. Get more traffic. As a product owner, one of the best things you can do is attract great affiliates to bring you more traffic. Consider offering 100% commissions on the front end and bonuses to top affiliates. Then make sure you have a killer backend set up, with mid-priced and high-priced products that make you bank on the leads affiliates send you. 4. Increase your conversion rate. Simple adjustments combined with testing can raise the conversion rate on your sales pages – sometimes significantly. If you look at your sales for the past year and then ask yourself – “If I had increased conversions by 2% over this time period, how much more would I have earned?” You’ll see that the increased income can be tremendous, all from tweaking and testing. 5. Sell more stuff and higher priced stuff to your existing customers. This is perhaps the best technique of all, and one that marketers often forget. Sure, you’ve got a $10 product and a $100 product, but what about that $500 a month coaching program, or the $1000 big product? Don’t be scared to bring out the big guns – it’s actually what some of your customers are craving. Also, offer select promotions to your customers – products that you have personally vetted and know will help them. These two steps alone can add thousands to your bank account each month. What to do right now: Work on #4: Increase Your Conversion Rate. This is the one thing you can begin working on immediately with very little effort that can make a tremendous difference. Imagine if you’re selling a $20 product and you’re getting 1,000 visitors a week. By increasing your conversions just 1%, you’ll make an extra $200 per week. Plus you’re increasing your list of buyers, which gives further opportunity to sell more products and more expensive products. And the higher your conversion rates are, the easier it is to attract great affiliates who send boatloads of traffic. Once you’ve increased your conversion rates, choose another method and begin working on that. 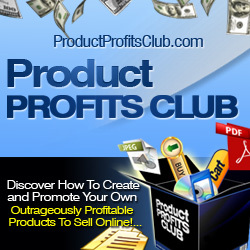 Before you know it, you may have doubled or even tripled your online income. Yes, when you’re a product owner, giving yourself a hefty raise really can be that simple.